New hybrid car debutes in Tokyo the "Puyo"
Takeo Fukui, the president of Honda Motor, arrived in the Puyo concept car for his speech at the Honda press conference at the 40th Tokyo Motor Show. While the edge-free design of the Puyo is remarkably uncluttered, it is not just another means of transportation. To begin with, the Puyo can make faces at pedestrians and keep its driver entertained. Frustrated with traffic? Well, you can pinch your Puyo — its body is made of a soft artificial skin using a lot of silicon — yes, the same material used in breast implants. The Puyo is a classic case of Tokyo Motor Show madness and Honda is just one of the Japanese car makers who can actually afford such a flourish. But whether they can afford or sustain such efforts, car makers — especially the Japanese ones — were intent on showing the world that they did not have to rely on fossil fuel forever. The other car that Fukui unveiled at the Honda pavilion was the CR-Z — a lightweight concept sports car with a clean hybrid powertrain. Unlike the pinch-able Puyo, the CR-Z is a peek at the near-future. Later, in an interview with Business Standard, Fukui stressed that Honda was hoping to sell around 500,000 hybrid cars a year five years down the line. Last month, Maruti Suzuki’s sales overtook those of Suzuki Japan, but there was hardly anything India-specific at the Suzuki pavilion at the Tokyo show. After stunning showgoers at the Frankfurt Motor Show with its Kizashi concept, Suzuki showed off its Kizashi 2 — a crossover SUV concept featuring a 3,500cc V6 engine and 4WD. It looks extremely worthy of series production indeed. 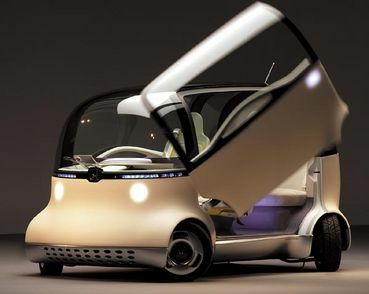 The egg-shaped Pixy concept showcased Suzuki’s efforts at sustainable mobility featuring individual mobile capsules and collision-preventing sensors. The Pixy was carried piggyback aboard the SSC — Suzuki Sharing Coach. The silly name notwithstanding, the SSC is a two-seat fuel cell powered car which can be charged by solar panels on the roof as well as windows. Adding shock value was the X-Head concept featuring a lean engine and 4WD. It is an extreme look at off-roading, and according to Suzuki, is aimed at providing a small all-terrain machine good enough for rescue operations. The Palette, a boxy two-box small car which is already in production in Japan, was being eagerly photographed by the Indian media. But it is a quintessential Japan-only car, according to sources at Suzuki, and will not be coming to India. The World Rally Championship SX4 hatchback was on display as well as a slightly revised world beater, the Swift, along with the new Splash. Toyota was smart enough to forecast the hybrid future almost a decade ago and is now successfully extending the powertrain concept to SUVs, for which the US — the largest market in the world — still has an affinity. The Lexus LF-Xh SUV hybrid concept marries an electric motor and a V6 petrol engine under a stylish skin that hints at the design direction the world’s second-largest car maker is adopting. A plug-in hybrid concept, the i-Real that communicates with people around it and a few more wacky reference models (mind you, Toyota can afford them) made up the largest pavilion at the show. Not all car makers are looking so far into the future. The charismatic leader of the Nissan-Renault combine, Carlos Ghosn — who became a cult figure in Japan for turning around the ailing Nissan brand — was busy unveiling the Skyline GT-R. The Nissan Skyline GT-R is stark opposite to the wild concepts — it is very much a production car that can be bought and driven from a Nissan dealer very soon. And driven very fast too, since its twin-turbo V6 motor that burns dead, old plankton can manage a 0-100 kph run in just 3.6 seconds when its driver is in a Ferrari-gulping mode. Nissan is in trouble again and Ghosn knows it better than anyone else that it is important to get people back into the showrooms and for that he needed a pinch of history and not an eco-weenie hybrid. Hence the resurrection of the Skyline GT-R brand which incidentally was nicknamed Godzilla for its awesome performance prowess. Ghosn and co were late for the hybrid bandwagon, but they have been doing some interesting work with lithium-ion batteries, and the second-generation Pivo concept on display proved just that. Certainly it had to reflect the Japanese love affair for robotics and featured a small robot which would calm down drivers when they get too angry behind the wheel. And yes, you never engage reverse gear in the Pivo — instead, the car will turn around 360 degrees and bingo, you can drive in the other direction. Mitsubishi, another car maker which is struggling to get out of the red, went for its glorious past to reinvent itself. On show were an aggressive new Lancer Evo X production car and an equally aggressive Concept ZT sedan that looks oh-so-production ready. Ford owns 33 per cent of Mazda, but the Japanese car maker has forged a design path never ventured into by the troubled Blue Oval. On display were all four of the Nagare line of concept cars which have flowing, never-before attempted sleekness to them. Like the previous efforts, the newest concept car, the Taiki, reflects the visual image of air flowing through a tube, no less! Sure, European and American car makers were present too, and the wares on the show ranged from limited edition Lamborghinis and Ferraris, AMG Mercedes-Benzes, stretched-out Maybachs and the usual suspects in the form of Audis and BMWs. But going by the sheer performance numbers of some of these machines (how about a Mercedes-Benz C-Class that has 517 bhp on tap?) and overall girth of things (the Hummer, anyone? ), the Japanese seem to have understood and reacted to the immediate challenges that greet the automotive world. Like the rising price of crude oil. The Japanese motor show this year featured 240 companies representing 11 countries. A total of 542 vehicles were on display at four pavilions — amongst them, 77 cars were being shown to the world for the first time.